Throughout Black History Month, Austin Community College sits down with influential and accomplished faculty and staff to discuss what Black History Month means to them. 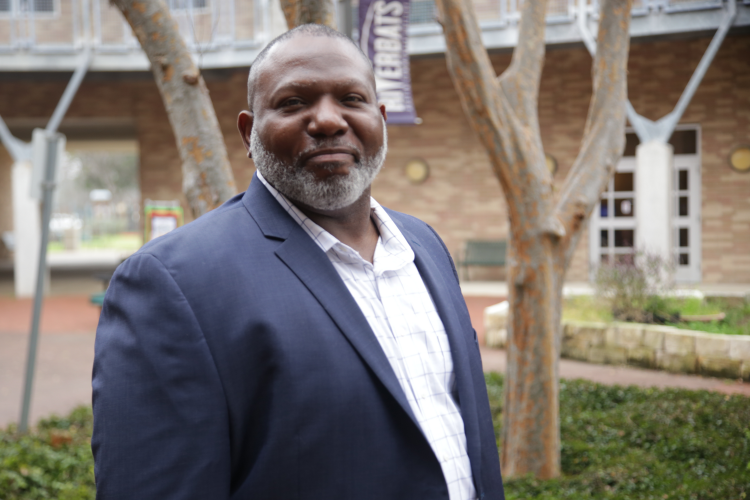 Meet Mervin J. Jones, Student Affairs dean. He has gone from serving our country to serving not just ACC, but the Austin community. After retiring from the U.S. Army, Jones joined ACC in 2008 as a counselor and associate professor. Read more about him below. What is your position at Austin Community College and when did you start? My position and role at ACC is Dean of Student Affairs at the Northridge Camps. I was hired as a counselor and started at the Riverside Campus in January 2008. Why do you think it's important for the college to commemorate Black History Month? I am proud of ACC's commitment to celebrating Black History Month for several reasons. From a historical perspective, Black Americans are responsible for initiating the equal rights of most underrepresented populations and groups in American. I would most like to meet with Malcolm X. He was never formally educated; however, he remains one of the most influential and misunderstood leaders America has ever known. What are some personal or professional accomplishments you are most proud of? I am most proud of my beautiful family. I have been married to my wife Annette Jones for over 30 years and together we have 4 beautiful daughters. I also served in the U.S. Army for nearly 23 years and retired in November 2007. In 2009, I initiated a collegewide celebration called "From Humvee to ACC," which was targeted at educating student veterans and prospective students about their educational and health-related benefits. During the same year, I served as a counselor for a collegewide African-American male support group called "Men of Distinction." I also served as a mentor for a collegewide African American support group called "Connected." In 2012, I created a student-led veterans' organization called "VALOR" (Veterans Achieving Leadership Outside the Ranks). In 2016, I was selected to serve as Associate Dean of Student Services for the Eastview Campus and quickly partnered with Professor Roland Hayes, Dr. Dorado Kinney, and community partners to create a men's conference called "Mastering Manhood." I was promoted 2 years later to serve as the Student Services Dean of the Northridge Campus. What's the best lesson you've learned? Maya Angelou has a quote: "I come as one, but stand as 10,000." This statement reminds me that I stand on the shoulders of many who have sacrificed their lives for my freedom and personal successes of which I will never take for granted. 1) Start by having a strong work ethic. Show up on time and do your job. 2) Learn from every experience. This includes learning from your failures and not being afraid to fail. 3) Respect everyone. Far too often, we tend to build relationships with the people we think can benefit us. I try to live my life by extending respect upfront to everyone whether they clean the buildings or lead the college. Austin Community College is emblematic of diverse perspectives. From my current vantage point, I can see how the college values the perspectives of multiple educational viewpoints and we are an exceptional institution as a result. How are you building bridges between communities? Since I started working at ACC, I found it important to build relationships with various offices within the college ranging from incredible faculty members to members of our Student Life leadership teams. Building such relationships has given me a fresh understanding of our great students. I am inspired by resiliency. I watched my parents demonstrate this important trait while growing up as a child in southwestern Louisiana. It is the gift I sought most to pass on to my children as they faced life's challenges. Finally, I have sat with students during very difficult days, tears, and distress. More often than not, I have witnessed their spirit of resiliency and it is absolutely amazing. In the spirit of Black History Month, I am most inspired when someone gets back up after being knocked down by life. My ultimate goal is to love and serve my family. My family extends farther than those who share my DNA to include the students, staff, and faculty of ACC who are now members of my family as well.